Thomas Faestermann (left) and Gunther Korschinek. Affiliation: Technische Universität München, 85748 Garching, Germany. Stars with a mass of more than about 8 times the solar mass usually end in a supernova explosion (SN). Before and during this explosion new elements, stable and radioactive, are formed by nuclear reactions and a large fraction of their mass is ejected with high velocities into the surrounding space. Most of the new elements are in the mass range until Fe, because there the nuclear binding energies are the largest. If such an explosion happens close to the sun it can be expected that part of the debris might enter the solar system and therefore should leave a signature on the planets and their moons. The interstellar space is not empty but contains dust and atomic particles, of course in minuscule densities. A SN is cleaning up the surrounding space such that empty bubbles (around 0.06 atoms per cm3) are formed surrounded by denser space (around 10 atoms per cm3). The sun is embedded in a so called local bubble , indicating that one or even more SNe should have happened near the solar system in the past. Considering these ideas we have started already in the past to search for SN traces on our Earth. The best suited isotope for such a signature is 60Fe. It has a half-life of 2.6 Myr  and it is not produced naturally on Earth, however it is also formed in small amounts by cosmic rays in interplanetary dust particles. To detect and measure such extremely tiny amounts of 60Fe an ultrasensitive method is needed. Accelerator mass spectrometry (AMS) is the only choice in this case. We have developed this method for many years using the Munich tandem accelerator, and achieve, besides a facility in Australia, the highest sensitivity worldwide . The principle is the following: negative ions are formed in an ion source, acceleration with a voltage of a few kV and then pass a combination of electric and magnetic fields as in a conventional mass spectrometer. Subsequently they are accelerated in the tandem accelerator to a high velocity on the order of 7% of the speed of light. In the tandem the negative ions traverse a thin carbon foil where they lose a certain number of electrons to become multiply charged positive ions. This process is so effective that absolutely no interfering molecules can survive. Thus a typical limitation in conventional mass spectrometry, molecular background, vanishes. In addition, because of the high energy of the ions, nuclear physics techniques are applied to reduce drastically possible interferences of stable isobars. In our case it is 60Ni in our iron samples which is suppressed that much that an isotopic ratio 60Fe/Fe of a few times 10-17 can still be measured. Our first studies in the past were focused on deep sea ferromanganese crusts. These depositions are very slowly growing, around 2 to 3 mm/Myr, on the bottom of the oceans, and accumulate elements present in the ocean water. As they collect also 10Be, a radioactive isotope with a half-life of 1.387 Myr, formed by cosmic rays on Nitrogen and Oxygen in our atmosphere, samples taken from different depths in the crust can be dated via the decreasing concentration of 10Be in deeper layers. The results of the most conclusive studies [4,5] are shown in fig.1. Figure 1: (click on figure to view with higher resolution) The 60Fe/Fe concentrations as measured in different depths of the ferromanganese crust 237KD (red points). The peak of an enhanced 60Fe/Fe concentration at an age of around 2-3 Myr is due to the flux of SN-formed 60Fe which has entered the solar system at that time. The blue triangles are from a separate measurement series where we have carefully leached out iron from crust samples and then analyzed. The vertical bars indicate 68% uncertainties, the horizontal ones the age range covered by the sample. From the measured concentrations we had deduced the 60Fe flux at that time and also the distance of one or more SNe. The critical point was however, the transport of the 60Fe from the upper atmosphere through all atmospheric processes towards the biosphere in the ocean until the final deposition in the ferromanganese crust. To circumvent this difficulty we considered  to search for 60Fe in lunar samples collected by US Astronauts between 1969 and 1972 and brought to earth. Together with colleagues from the Rutgers University, New Jersey (USA), we applied successfully for selected sample material from the astronomical laboratory of the Johnson space center (NASA). An enhanced 60Fe concentration in lunar material would be a clear proof of our previous measurements and the conclusions drawn. It must have been deposited everywhere in our solar system, on all the planets and their moons. In addition, the total amount of 60Fe would provide solid data for the fluence and also the distance of the SNe because the 60Fe has been collected directly on the surface of the Moon. The drawback is however that the moon does not deliver the chronological information like the crust samples. The lunar surface (regolith) is constantly stirred and mixed by the impact of micrometeorites (a process called gardening) and also sporadic impacts by full-sized meteorites, thus losing any precise time information. A further drawback is that 60Fe is also formed by the much higher cosmic ray flux via nuclear reactions on Ni which is present in lunar regolith, albeit only in tiny concentrations. To quantify this contribution we compared the lunar data with data from iron meteorites, which have been exposed for many millions of years to cosmic rays, and which we investigated as well. We know that cosmogenic 60Fe is formed by nuclear reactions only on the heaviest stable nickel isotope 64Ni. 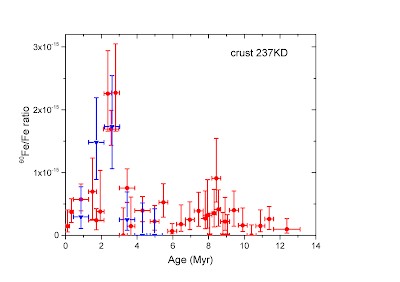 We know also that another long-lived radioisotope 53Mn (T1/2 = 3.7 Myr) is formed by cosmic rays on stable iron. In the case of additional SN produced 60Fe the concentration ratios of 60Fe/Ni to 53Mn/Fe should be higher in the lunar samples than in the meteoritic data. Fig. 2 shows the comparison of 11 lunar samples (red points) with meteoritic samples (green points). Instead of concentrations we plot by convention their activity (disintegrations per minute) relative to the amount of the target element Ni and Fe. 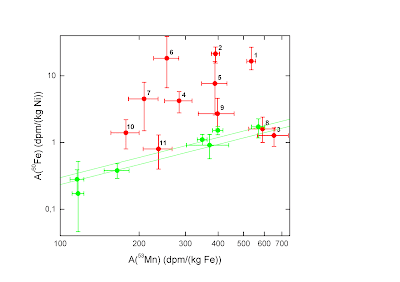 The meteoritic data follow, as expected, a proportionality (the range between the green lines), indicating that 60Fe like 53Mn is produced by cosmic rays; the scatter of the activities is mainly due to differences in the meteoroid geometry. Most of the lunar samples have 60Fe activities well above the expected relationship of the meteorite samples because of the SN contribution. Only three of the lunar samples have activities comparable to cosmic ray origin; they are from greater depth or have a complicated history; e.g. sample 3 is eroded material from the surface of a rock thus has no SN contribution. Figure 2: (click on figure to view with higher resolution) The measured activities of 60Fe versus 53Mn in meteoritic and lunar samples. 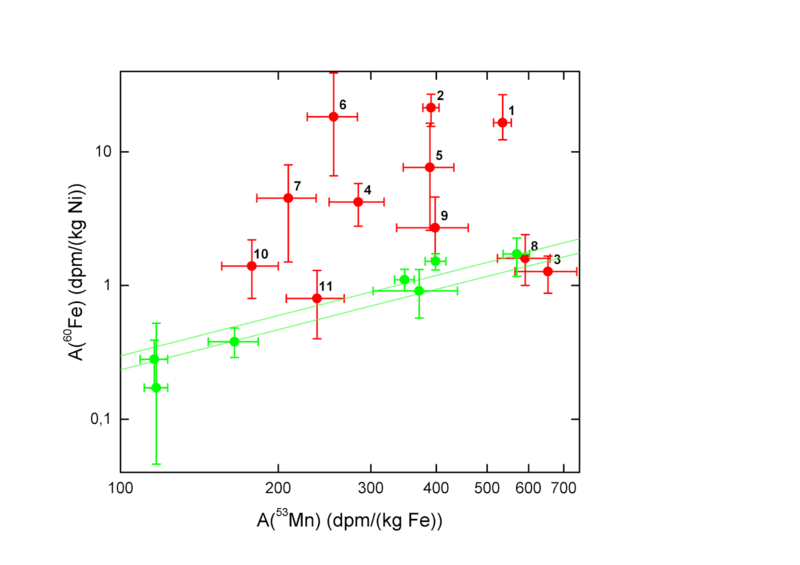 Units are disintegrations per minute per kg Fe and Ni, for 53Mn and 60Fe, respectively. Samples 1 through 11 (red) are lunar samples; the other values (green) are for iron meteorites. The area between the green straight lines indicates the 68% error band for cosmic ray produced 53Mn and 60Fe activities in meteorites. Any 60Fe signal is expected to be distributed downward due to gardening of the lunar surface . In Fig. 3 we show the SN produced 60Fe concentration (cosmic ray contribution subtracted) as a function of the depth (areal density) of the samples. The deposition of the 60Fe on the lunar surface must have happened on a time scale of Myr, since already considerable gardening has happened and, on the other hand, cannot have happened more than some 3 half-lives, i.e. 8 Myr, ago to be still detectable. Thus it is very likely that it coincides with the 60Fe surplus in the ferromanganese crust, which was collected between 1.7 and 2.6 Myr ago. In a time period of around 2.2 Myr, gardening is expected down to a few g/cm2. It is reasonable, therefore, to integrate the measured 60Fe concentration over this range, in order to estimate the local fluence of 60Fe. 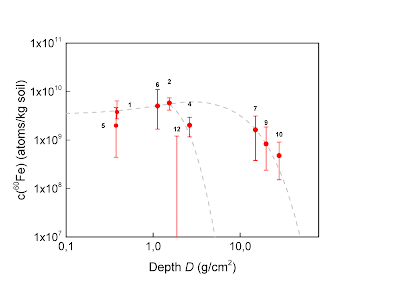 Nevertheless we found also elevated concentrations of 60Fe down to a depth of 20 g/cm2 (Fig. 3), indicating possible excavations by meteorites and/or down-slope movements. 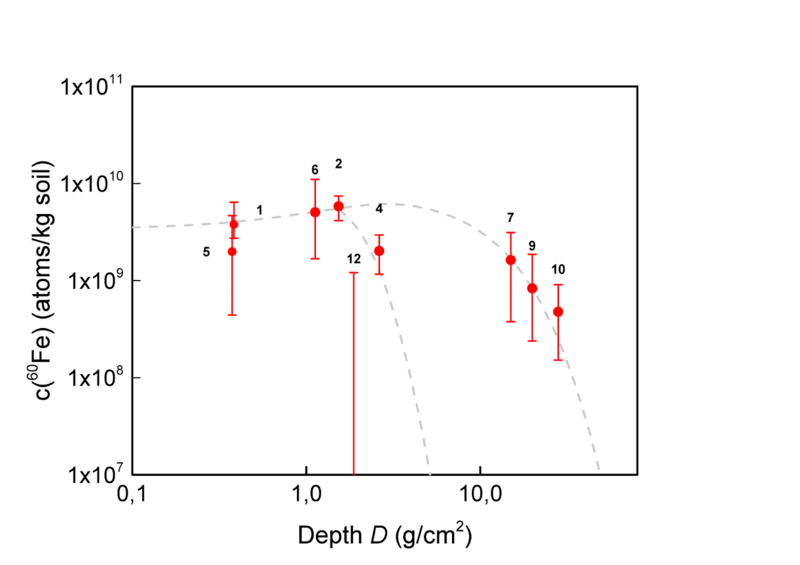 Figure 3: (click on figure to view with higher resolution) Depth dependence of the SN produced 60Fe concentration and estimation of the local fluence of 60Fe on the Moon’s surface. The dashed curves represent two different integration scenarios. They symbolize a lower and an upper limit. The error bars indicate a 68% confidence level. Thus, an inclusion of these deep samples yields an upper limit of 60Fe for the integration to obtain a local interstellar fluence of 60Fe. As the lower limit (smallest depth) we adopted that of sample 4. From the data we can estimate a range for 60Fe/kg soil. Including corrections for the decay, and assuming a uniform spread over the lunar surface we end up with a fluence between 0.8 x 108 atoms/cm2 and 4 x 108 atoms/cm2 which was deposited during the past about 4 Myr. If we assume that this fluence came from a single SN and that the (typical) theoretical 60Fe mass of 2x10-5 solar masses has been ejected and formed dust to penetrate the solar system, then the SN would have happened 300 to 600 light years away. In conclusion, our results show for the first time that the SN-formed 60Fe has been also collected by the Moon, thus confirming the SN origin of previous measurements of 60Fe on Earth. It delivers also more solid data for the fluence of 60Fe which allow better theoretical estimation of other long-lived radioisotopes released by the SNe around 2 Myr ago. Theoretical considerations interpret our findings as SN activity in an association of young stars. They even seem to find good candidates like the Sco-Cen association  where the exploding stars could have been 2 Myr ago at a distance of around 300 light years or the Tuc-Hor association at about 150 light years . In addition, further evidence for the SN activity has been added recently. An enhancement of 60Fe has been found in ocean sediments at an Australian laboratory  and by our group . This gives us a much better timing information than the crust and shows that the SN activity lasted for about 1 Myr and started about 2.7 Myr ago. Even in cosmic rays 15 nuclei of 60Fe have been detected with the spectrometer CRIS aboard NASA’s satellite ACE (Advanced Composition Explorer) . The authors conclude that at least two SNs must have occurred within 3000 light years from the sun during the last few Myr. Analysis of the spectra of high-energy cosmic rays leads to similar conclusions . T. W. Berghöfer, D. Breitschwerdt, "The origin of the young stellar population in the solar neighborhood - A link to the formation of the Local Bubble?”, Astronomy & Astrophysics, 390, 299 (2002). Abstract. K. Knie, T. Faestermann, G. Korschinek, G. Rugel, W. Rühm, C. Wallner, "High-sensitivity AMS for heavy nuclides at the Munich Tandem accelerator”, Nuclear Instruments and Methods in Physics Research B, 172, 717 (2000). Abstract. 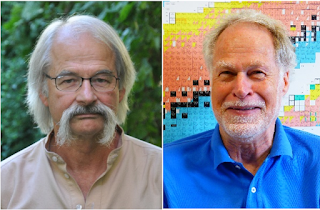 G. Rugel, T. Faestermann, K. Knie, G. Korschinek, M. Poutivtsev, D. Schumann, N. Kivel, I. Günther-Leopold, R. Weinreich, M. Wohlmuther, “New Measurement of the 60Fe Half-Life”, Physical Review Letters, 103, 072502 (2009). Abstract. 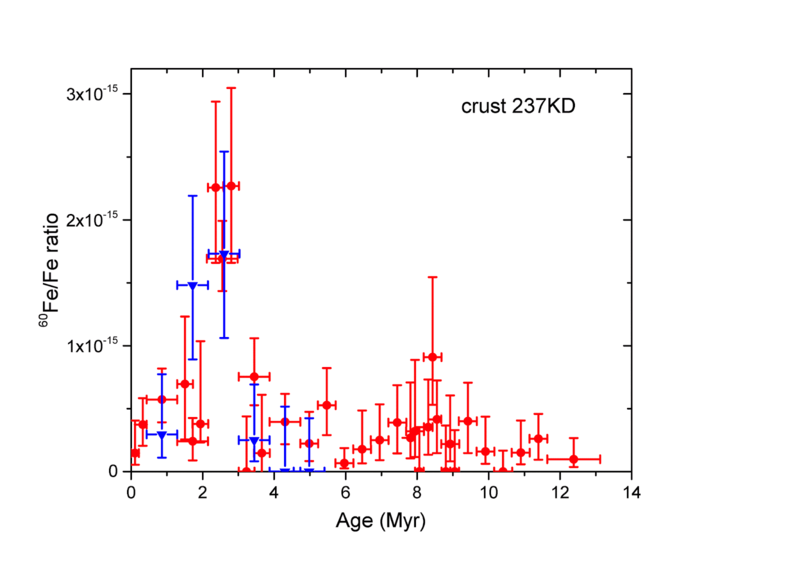 K. Knie, G. Korschinek, T. Faestermann, E. A. Dorfi, G. Rugel, A. Wallner, "60Fe Anomaly in a Deep-Sea Manganese Crust and Implications for a Nearby Supernova Source”, Physical Review Letters, 93, 171103 (2004). Abstract. C. Fitoussi, G. M. Raisbeck, K. Knie, G. Korschinek, T. Faestermann, S. Goriely, D. Lunney, M. Poutivtsev, G. Rugel, C. Waelbroeck, A. Wallner, “Search for Supernova-Produced 60Fe in a Marine Sediment”, Physical Review Letters, 101, 121101 (2008). Abstract. L. Fimiani, D. L. Cook, T. Faestermann, J. M. Gómez-Guzmán, K. Hain, G. Herzog, K. Knie, G. Korschinek, P. Ludwig, J. Park, R. C. Reedy, G. Rugel, “Interstellar 60Fe on the Surface of the Moon", Physical Review Letters, 116, 151104 (2016). Abstract. D.E.Gault, F. Hoerz, D.E. Brownlee, J.B. Hartung, "Mixing of the lunar regolith”, Proc. 5th Lunar Science Conference, Vol. 3, 2365 (1974). Abstract. D. Breitschwerdt, J. Feige, M. M. Schulreich, M. A. de. Avillez, C. Dettbarn, B. Fuchs, “The locations of recent supernovae near the Sun from modelling 60Fe transport”, Nature, 532, 73 (2016). Abstract. Brian J. Fry, Brian D. Fields, John R. Ellis, “Radioactive Iron Rain: Transporting 60Fe in Supernova Dust to the Ocean Floor”, Astrophysical Journal, 827, 48 (2016). Abstract. A. Wallner, J. Feige, N. Kinoshita, M. Paul, L. K. Fifield, R. Golser, M. Honda, U. Linnemann, H. Matsuzaki, S. Merchel, G. Rugel, S. G. Tims, P. Steier, T. Yamagata, S. R. Winkler “Recent near-Earth supernovae probed by global deposition of interstellar radioactive 60Fe”. Nature, 532, 69 (2016). Abstract. Peter Ludwig, Shawn Bishop, Ramon Egli, Valentyna Chernenko, Boyana Deneva, Thomas Faestermann, Nicolai Famulok, Leticia Fimiani, José Manuel Gómez-Guzmán, Karin Hain, Gunther Korschinek, Marianne Hanzlik, Silke Merchel, Georg Rugel, “Time-resolved 2-million-year-old supernova activity discovered in Earth’s microfossil record”, PNAS, 113, 9123 (2016). Abstract. W. R. Binns, M. H. Israel, E. R. Christian, A. C. Cummings, G. A. de Nolfo, K. A. Lave, R. A. Leske, R. A. Mewaldt, E. C. Stone, T. T. von Rosenvinge, M. E. Wiedenbeck, "Observation of the 60Fe nucleosynthesis-clock isotope in galactic cosmic rays", Science, 352, 677 (2016). Abstract. M. Kachelrieß, A. Neronov, D. V. Semikoz “Signatures of a Two Million Year Old Supernova in the Spectra of Cosmic Ray Protons, Antiprotons, and Positrons”, Physical Review Letters, 115, 181103 (2016). Abstract.